I'm definitely keeping things light and easy during these hot summer days. As much as I love my white skinny jeans, my flared pair by Paige Denim has quickly become my new favorite. A simple pony tail and my go-to flowy blouse (last seen here) were just what I needed to beat the heat this past weekend. I hope everyone was able to stay cool and enjoyed the weekend! gorgeous look hun! love the simplicity of this outfit! love those white jeans! they look so good one you! LOVE those flared jeans - they look fabulous on you! This look is perfect sweetie!!! I love the proportions. The top and jeans are so classic and forever chic! It's awesome how you balanced the proportions! Those bell bottom jeans fit you like a dream, love TJ M! The whole outfit is perfect! Love the white flare jeans! Super cute! Love that casual striped top! So stylish, makes me wish the heat would calm down so I could wear my white pants again! Love, love, love those pants. I love a great black and white outfit. And I love the cut of these pants!!! Oh I am SUCH a fan of Paige! These flares look so perfect on you, Audrey! Love a great white jean! I love these white flares - they look great with that flowy blouse! These flares look incredibly chic on you...darling with a loose blouse :) And they are just perfect, look like they were made for you! 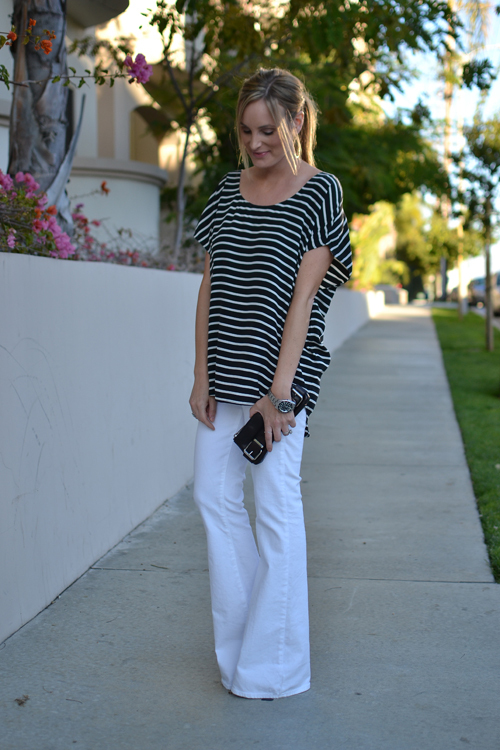 I'm on a nautical stripes kick right now so I love the top! The pants are a perfect pairing! You look amazing & love the simplicity of your outfit & your pants looks amazing! The combination is perfect for this hot summer. The white pants are so fresh and chic! just found your blog and love your aesthetic! and guess what? i just started a new blog! i think i have a few good ideas if you'd like to stop by and follow it, if you like! I love those jeans! I tried them on at Marshalls and they fit perfectly. But for some crazy reason I didn't get them even though they were only $35. By the time I came to my senses and went back to buy them, they were gone :( Now I will just have to lust over yours. 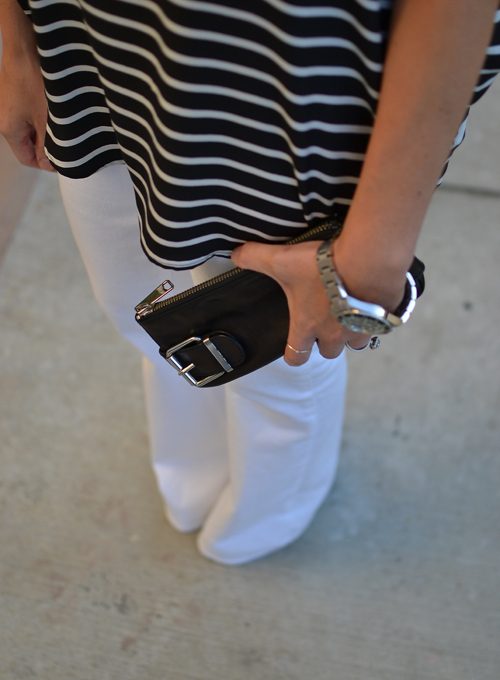 This is truly a very chic summer outfit....I love that white jeans!! I love the flairs paired with a flowy top. Such a great look on you! love the stripey top, and it looks great with those jeans. I feel like I can't pull off wide leg jeans, but they look cute on you! this year the summer had really brought some serious heat. i love your take on it. simple and effortless. the joie top is lovely! This is such a classic combo Audrey. Actually a very refreshing change from all of the prints / neons and pastels around!! I just love your style! Always so simple but trendy chic! this is so pretty!! such a fresh summer look!! Cute look! Loving your flaired jeans! I been look for a pair forever, but haven't found a pair that fit right! So they always complain on Fashion Police when someone has their shoes covered by their wide leg or bell hems, saying that it looks like feet have been amputated, but I absolutely love the way it looks and feels (which = tall for me!). You look effortless and chic! Enjoy your week! I don't know what it is, but whenever I see someone else wearing flared pants, it looks GREAT (I love the breezy look you've captured here!) but when I wear them I look absolutely ridiculous. Love this look!! I need to put my flares back in rotation! You have reminded me how great they can look! This is simple yet a fun and sexiness about it.